1968 Imperial “Burns” Japanese Electric Guitar – Drowning in Guitars! You think you’ve seen strange? Man, this guitar right here is probably the most bizarre of the bizarre! I mean, come on! How wacky can you get!?!?! Totally original design here! This one had me stumped for a while but I finally figured it all out, and what a relief too! Check out those crazy horns! Very reminiscent of the Tokai Hummingbird guitars. But then check out that crazy upper bout, and the triangular inlays, and the nutso split pickups, and the Burns-like pick guard!! I got this guitar in New Jersey and when I laid my eyes on this one, I was just in awe. I just would not be a good poker player. The guitar has plenty of wear and finish checking. And good grief, the neck was so messed up. 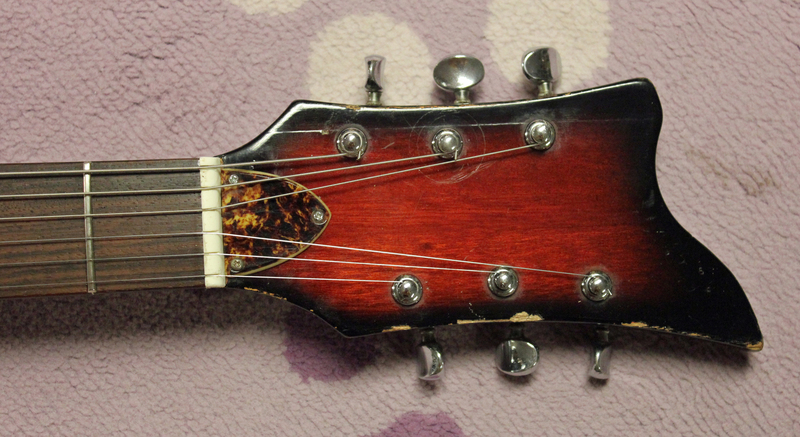 In fact, almost everything about this guitar was messed up! It ALL needed serious work by a serious tech, and thank god for Dave D’Amelio!!! He spent DAYS on this guitar, and we were both pleased with the results. This sicko is now an everyday player, which is the goal of all my guitars. I just don’t believe in wall hangers, although when you start to accumulate so many guitars then some tend to stay on the wall longer than others. But this psycho is getting some regular play right now! OK, so here’s what I found out about this guitar. 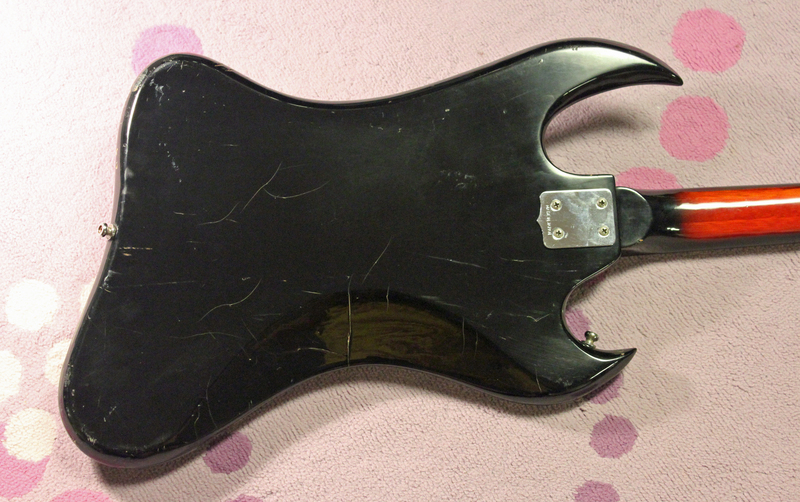 It was made at the old Teisco factory after Teisco was absorbed/taken over/bought out by Kawai. All Teisco guitars from 1967 onwards were made at the Kawai factory, but the old Teisco factory continued to produce guitars into the 1970s, and this one is the weirdest example, right? The headstock is very similar to my Imperial 4 pickup guitar, and I’ve talked to two other “experts” that own these and have seen these guitars with an Imperial badge. But it wasn’t until I spoke with a really nice Japanese fellow named Ryo (or Ryo san in Japanese, hey, I’m learning!!) that I learned even more about these guitars. There was a music store in Tokyo owned by a company called Hara Gakki. They carried a full line of guitars that carried the brand name….get this….BURNS!!! That’s right, not Burns of London, but there was a Burns of Tokyo! 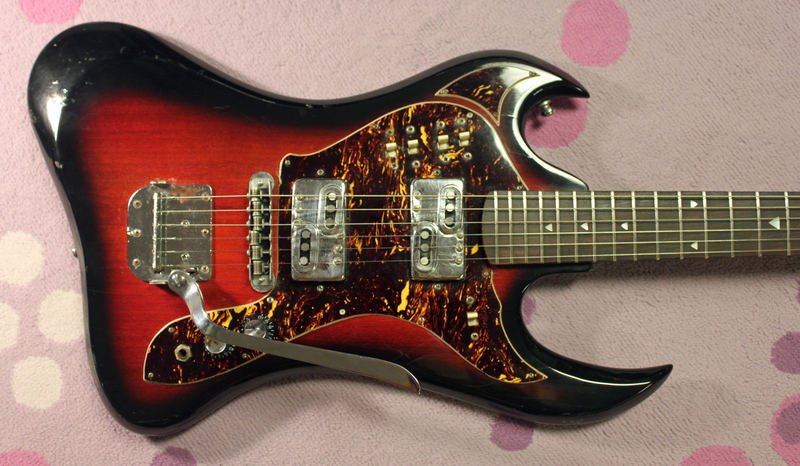 Hara Gakki started selling the Japanese Burns guitars in the spring of 1967, and supposedly stopped around 1969. Of course, these Burns guitars were never meant for sale outside of Japan, but apparently some of this exact style were imported by the Imperial Accordian Company. Either way, this is one of the more rare Japanese guitars to ever cross the ocean. Other Burns (Tokyo) guitars included some Fender copies, and some semi-original designs very similar to some Noble and Norma guitars from the later 1960s. So once again, I can sleep well at night knowing I figured something out! And our post wouldn’t be complete without leaving you with a video of Mike Dugan playing one of the wackiest guitars either of us had ever seen! He was almost scared of this one! This is an Imperial. I have two of them. One with your color scheme and pick-up configuration and another with 4 white-face single coil pick ups that are rounded and not the typical Kawai variant. That one is a green burst. As for the manufacturer…I am not sure. I think this was post Kawai/Teisco merger and not either. I think this might be an early seventies Guyatone or possibly a Pleasant. The switches are strange too. Funky cool guitar though. You know, I really appreciate your comments. I also made that Imperial connection because there is a similar guitar on Gbase that’s labeled Imperial. Also, some of the Imperial guitars featured a recessed jack plate, a la Fender Stratocaster. The Avalon Shaggs guitar also has similar features to the Imperials. 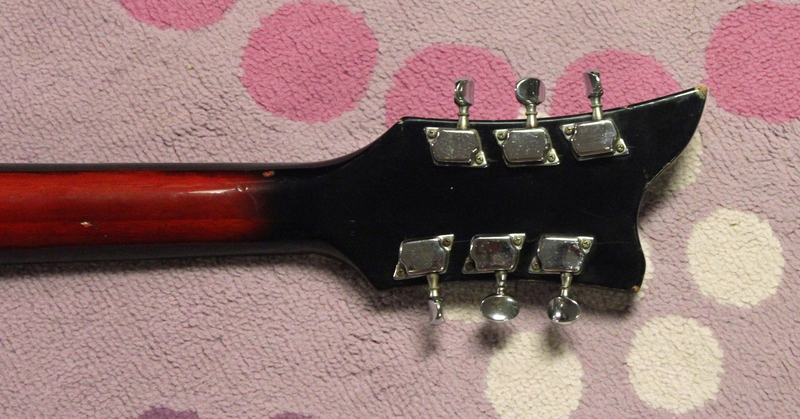 I believe this one was made by one of the smaller Japanese makers that sprung up during the 1964-68 guitar boom. I wish I knew who it was!! thank you so much, I have one just like it, but someone sanded it down and paint it with house paint, I strip it and refinished the whole thing. no one could ever tell me who made it, I was sure it was Japan made, my problem is the pickups are shot, I have been told they are to far gone to fix, so, is just there, i will love to play it someday..
Don’t give up too soon on those pickups. Dave D’Amelio down at Happy Guitar Repair can usually fix them. I’ve owned three of these and 2 of them had some dead coils that were fixed/rewound by Dave. My name is Richard Sell and I am the owner of PureSalem Guitars ….. I fell in love with this guitar the first time I saw it. When we were choosing models for production this one made the top of our list. We will be offering this in both left and right handed versions. Look for us to open early 2013 …. If you try a google image of PureSalem Guitars you can see a photo of our re-issue. Hey man, I’m glad we inspired you! I have two of these guitars now! When your guitars come out you’ll have to send us one to demo, kay? BTW, you picked what is probably the most radical design ever to come out of Japan, good eye! I agree that it is a very cool guitar …… We will be bringing back some ghosts from the past …. PureSalem will continuously be introducing new models …. Limited runs of strange and wonderful guitars. Our website will even have a requests page, the SHAGGS GUITAR is the current unofficial front runner. That may change once we open. When the time comes I would love to have you demo the guitar …. Thanks and all the best !!! So stoked, just ordered an Imperial Lefty prototype on Ebay!!! Very much looking forward to seeing and playing this guitar in person! Just a quick update …. PureSalem will open in June / July and we have brought back to life this awesome guitar … We changed a few things and call it the CLASSIC CREEP. There are some photos up on our Facebook page if you are interested. I have to thank Frank for DROWNING IN GUITARS …. It is truly a labor of love and one hell of a website …. Hey, I have an Imperial guitar too. Would you help me on tell me more about her??? Do you have one just like this one in the article?